Monday Funday….Kramer’s Cologne Can Be Concocted! It’s finally possible because scientists have unlocked the secret of why the beach…smells like the beach. Totally useless information for your Monday…. The ocean is full of phytoplankton, microscopic organisms that create their life’s energy by absorbing sunshine. For reasons that aren’t completely understood (some scientists believe that it may be a form of microscopic sunscreen) phytoplankton also produce dimethylsulfoniopropionate. But as with all of God’s creatures, phytoplankton die. For those of us raised on the carcinogenic coast of Texas, it’ll come as no surprise that the ocean is also full of bacteria. And when phytoplankton die they’re eaten by the oceanic bacteria. As the bacteria digest the dimethylsulfoniopropionate, dimethyl sulfide gas is produced. And dimethyl sulfide gas is primarily what you smell, when you smell the ocean. Random useless knowledge for you…. Half…yes HALF…of the world’s oxygen is produces by photosynthesizing phytoplankton. I don’t know why that’s so interesting to me, but it is. Here all this time I thought the rain forests were super important and it turns out that as long as I live close to the ocean I don’t need them at all! Clouds of dimethyl sulfide gas will hover over the ocean and attract sea birds, who presume in their little democratic bird brains that the bacteria eating the phytoplankton will be eaten by increasingly bigger ocean critters until something is swimming around that’s big enough for the birds to eat. Because of the process involved in creating it, the dimethyl sulfide gas clouds are primarily found near the seashore. So the smell of the “ocean” isn’t actually the ocean at all….it’s the smell of the edge of the ocean. In the middle of the Atlantic it smells different than at the edges. 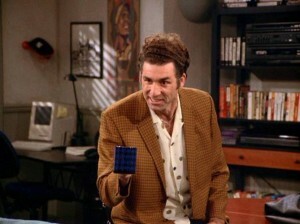 So yes, Kramer has been vindicated. As you’ll remember from Seinfeld, Kramer wanted his cologne to smell like the beach but Calvin Klein stole his idea and named it “Ocean”. Well, based on satellite images of dimethyl sulfide clouds we now know that the smell of the beach isn’t the same as the smell of the ocean….and Calvin Klein picked the wrong name for their stolen aroma.